This intriguing creation has me both charmed & perplexed. To celebrate the upcoming release of Tim Burton's 'Alice in Wonderland' movie, Disney has gone for something more fletching (and expensive) than the typical mouseketeer ears. Yes, Disney is now doing .... jewellery couture. 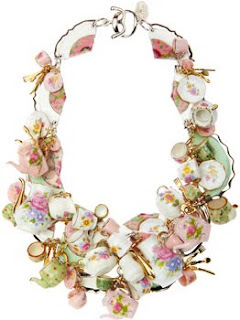 This Disney Couture Tea Party Necklace is quite exquisite in its execution. Designer Tom Binns has carefully crafted this flurry of tea pots, cups, mini-saucers & cutlery into one of the more unique pieces of jewellery seen in ages. It's quite dainty and obviously meant for the most lady-like of wearers. I must say it's really pretty & I can't stop gazing at it, but I also ponder how comfy it would be to wear. Wouldn't those sticky-outy pieces of tableware poke and prod? Or pinch? And the noise... I bet it makes its fair share of clinky, clanky racket. Too noisy, too pinchy for me. I'm with you on this one, it looks lovely BUT to wear it would hurt, probably look a bit silly to wear. I would put it in a glass enclosed case and tell my friends it was a museum quality piece not to be worn by humans! It is lovely but looks dreadfully heavy! You have to love Disney.. I can't even imagine what one could wear that with. You could only have that as a display piece, that's it. Very pretty, but totally impractical, I have to agree. Interesting & beautiful but waay too busy for me. Pretty to look at on someone else's neck, not my own.